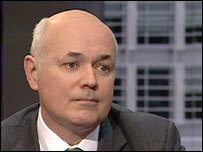 Former Conservative leader Iain Duncan Smith is MP for Chingford and Woodford Green and Chairman of the Centre for Social Justice. In this Platform he makes the case for John McCain. In recent weeks we have published Simon Burns MP in support of Hillary Clinton and Nick Bourne in support of Barack Obama. It is not fashionable in Britain, amongst the metropolitan elite to do anything but extol the virtues of Barrack Obama and his message of change. There have been so many paeans of praise for Obama in the media, from pundits and politicians alike, that one would be forgiven for thinking that the US election is over and Senator Obama is the 44th President of the United States. Yet I think they all underestimate John McCain by assuming it is over bar the victory parade. This underdog knows how to fight. McCain is a man who has great wells of courage and determination. I’m not sure how many people reading this know of his biography, ‘Faith of my Fathers,’ a remarkable book which unlike the usual self serving memoirs of most politicians is inspiring and enlightening. It tells of a man who has the courage and integrity to restore respect to the institution of the Presidency. Most know of the fact that he was tortured as a prisoner of war in Hanoi but what they don’t realise is that he had been offered a chance of early release because his father had taken over command of the Pacific fleet. He refused saying he would only be released when those who had been in captivity longer were let out. The North Vietnamese unable to get their propaganda coup beat him for a number of days so severely that he couldn’t stand. These beatings continued off and on for the next year and a half, yet he never took early release. McCain is also someone who hasn’t been afraid to follow his own course, even if it offended his own party, if he thought it important. On the need for campaign finance reform he infuriated his party as he sided with others to try and improve a system he felt was open to abuse. Even on climate change, long before it became fashionable McCain was leading the way, warning of the problems the USA was storing up for itself and the rest of the planet by its reckless consumption. Whether you agree with his stance on global warming or not and I suspect many reading this may not, my point is that such independence of mind is seen in other successful leaders, I think of Churchill on the Nazi’s and Reagan on market economics, both who infuriated their parties elite but were proved right in the end. One shouldn’t forget how, whilst supportive of the war in Iraq, he has for sometime been critical of the running of it and was the main exponent of the ‘surge’ which has so changed the environment in Iraq for the better, offering real hope of a defeat for Al Qaeda. The opportunity is there now to make Iraq the most stable and powerful nation in the region and a strong counterbalance to Iran. At the critical moment when that can be achieved after all the sacrifice, Barrack Obama is pledged to pull US troops out. Contrast that with McCain’s determination and vision to champion the change of strategy that has made this possible, against the fashionable opinion of the commentators. ‘Be careful what you wish for lest it come true.’ Pundits over here talk longingly of having a President who is liked by the rest of the world and easier to deal with. Comparisons have been endlessly drawn between Barrack Obama and Kennedy or Bill Clinton, both much liked in European capitals. Both were, like Obama, charming and spoke of change, yet it was Kennedy’s ‘Bay of Pigs fiasco’ that paved the way for the Cuban missile crisis and Clinton’s failure to deal with Al Qaeda which led to 9/11. With two major conflicts in Afghanistan and Iraq, the continuing threat from Islamic terrorism and a global economic crisis affecting us all, it’s not likeability we should wish for from the future President, but courage, character and judgement, for all our sakes. > Visit the John McCain video archive at PlayPolitical.